Coris BioConcept are leaders in the field of antigen detection tests for enteric, gastric and respiratory diseases. These tests are based on the immunochromatography technology with colloidal gold particles or latex microspheres. Coris products for rotavirus and adenovirus have been in use in U.K. hospitals since 1997. ​Rotavirus, Adenovirus group and Adenovirus 40/41 tests are available in strip and cassette formats. Controls are also available. The introduction of rapid antigen detection tests for H. pylori provided an alternative to E.I.A. tests. Our U.K. users reoprt that, as single and simple tests, samples can be processed immediately with benefits to laboratory workflow and removal of the delay in reporting often seen where laboratories batch by E.I.A. Both strip and cassette formats are available.​ A control is also available. The use of immunochromatographic tests for the detection of cryptosporidia and giardia provides a rapid and low-skill alternative to microscopy. Giardia in particular can be easily ovelooked by microscopy. 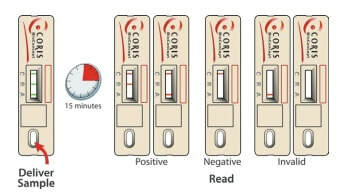 The Coris BioConcept Legionella K-Set is a 15 minute test, simple to use with no requirement for dilution. This kit comes with positive controls. Products for Respiratory Syncitial Virus (RSV), Respiratory Adenovirus and Influenzae A+B are available. A control for Giardia is also available.